DRIVING DIRECTIONS to Sennett’s Hole from I-85: take Exit 176, Duke Street. Head north on Duke St. away from Northgate Mall. In 2.3 miles, Duke St. will merge with Roxboro Street. Continue north on Roxboro St. for 1 mile. At the Seven Oaks Road stoplight, turn left into the entrance of West Point on the Eno City Park. Just past the entrance, the park drive veers to the right and becomes one way. Park in the first parking lot on the left. The physical address is 5101 North Roxboro Street, Durham NC 27704. HIKING DIRECTIONS to Sennett’s Hole: Walk toward the southwest corner of this first parking area. You should see a break in the trees and a gravel path toward a shelter. Take the path down the hill past the shelter. You should come to the gravel park drive; cross it. Then cross the wooden footbridge over the creek (Black Meadow Branch) and take an immediate right onto the Buffalo Trail (blazed with white dots). The trail heads uphill and flattens out. Stay straight and gradually the trail comes back downhill where it meets Warren Creek. Rock-hop across the creek. Do not attempt to cross it during high water events! Once you reach the opposite bank, you are on the Sennett’s Hole Trail (blazed in red dots). The trail crosses the open sewer easement at a left-hand angle from the creek to the far tree line. Once across the easement, you should see the river come into view. This spot is the hidden gem for the month—Sennett’s Hole. The trail follows the Eno, upriver for a few hundred feet. Do not turn uphill onto the social trail at the river’s edge, instead follow the trail as it loops back on itself and comes out near the easement. Once you reach the creek again, cross and make an immediate left on the South River Trail (blazed in yellow dots). The trail follows along Warren Creek, then heads uphill, where it begins to follow the Eno. You should see glimpses of the river as you hike along the ridge. Be careful of steep drop-offs in some places. The South River Trail comes out at the West Point Mill dam. You’ll cross the wooden bridge over the headrace, where water is being diverted from the river. Follow along the river until you reach a longer wooden bridge on your right. Cross the bridge and explore the West Point Mill, which is the hidden gem for next month. Just past the mill, you will see the park drive. To get back to your vehicle, you can walk either way along the gravel drive, paying attention to visitor traffic. This round-trip hike is approximately 1.75 miles. Michael Synott comes down to us in both history and legend. We know from records, that he was a miserly old bachelor given to fast dealings in real estate and in constant trouble in the courts. He kept tavern at his house and there he entertained the Moravian Bishop Spangenberg and gave shelter for three months to the sick members of his party. The brothers had fallen sick on their way to look for a good place for a Moravian Settlement. Synott was so intrigued by Spangenberg’s mission (which resulted in the Unitas Eratrum of Wachovia) that he rode on with them for three weeks. The bottom left photo (by Ella Srikhirisawan) is a great photo of Sennett’s Hole taken from the north bank of the river. We only gave hiking directions from the south side of the river, but Sennett’s Hole can also be accessed from the north bank via the Eagle Trail. Check West Point on the Eno park maps to plan your route. The bottom right photo (by Banks Dixon of Frog Hollow Outdoors) was obviously taken in a cooler month of the year, when the Eno River rises and falls with more frequent heavy rains. 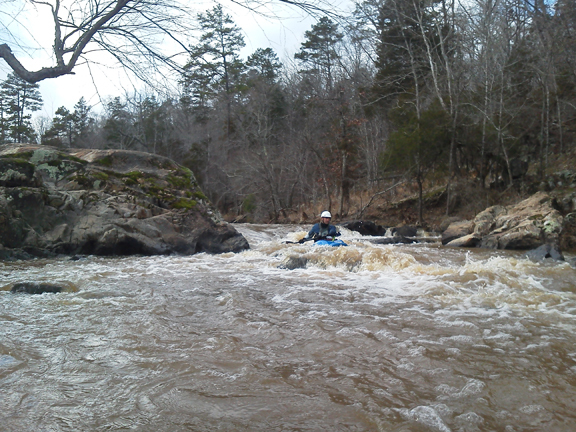 The Eno is great fun for paddlers of all skill levels, but be sure to plan ahead and know what you are doing before braving the pools and rapids. 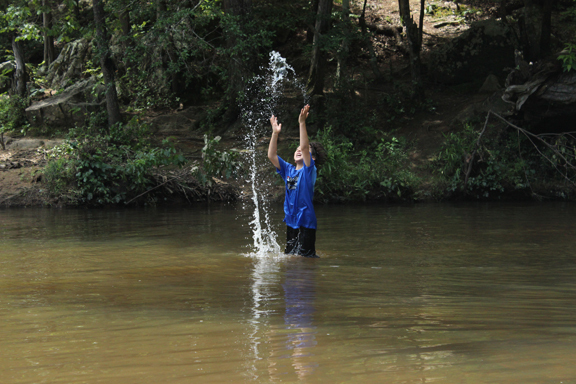 Checkout our information about paddling at: http://www.enoriver.org/events-and-activities/outdoor-recreation/paddling/.